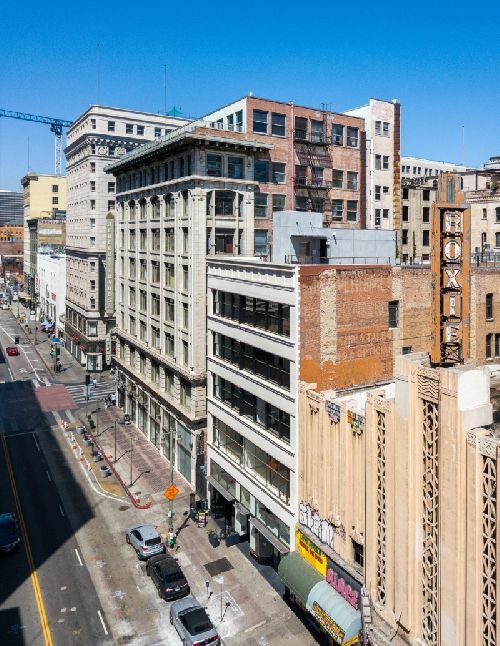 Korean video game developer, NHN Global, has purchased the historic Pettebone Building in downtown L.A. and will be relocating its headquarters, which is currently in Koreatown, to their new property. The company paid $22 mil, or $595/sf for the five-story, 37k sf building, located at 510 S. Broadway. The Pettebone Building was originally built in 1905. It was sold by Los Angeles-based RYDA, who purchased it in 2015. Since then, RYDA designated the building as a Historic-Cultural Monument and performed extensive work, updating the 114-year-old landmark with a full core and shell renovation, restoring the early 1900’s façade and intricate original window system. Along with exposing the original brick and steel structure to cater to creative users, RYDA has also added modern upgrades such as new elevators, fiber internet, and an expansive 3k sf rooftop deck offering unencumbered views of Downtown L.A. Retail tenants include Mezcalero, a popular Mexican restaurant offering tacos and cocktails, and the upcoming YAKIDO, a famed yakitori restaurant from Hong Kong. Andrew Tashjian and Michael Gooch from Cushman & Wakefield represented the seller in the transaction. Carle Pierose of Industry Partners repped the buyer in the deal. “Not only does this high watermark sale speak to the vision and expert craftsmanship of RYDA, but it also demonstrates the tremendous evolution and appeal of Downtown L.A., and particularly the Historic Core, as a real destination for brands and world-class tech enterprises,” said Tashjian. “When we purchased the asset, a majority of the building had been empty for decades. We immediately saw its potential and were delighted to breathe new life into this beautiful piece of Los Angeles history, while also reinvigorating a stretch of Broadway that the immediate community—and Angelenos everywhere—could really be proud of,” said Daniel Neman, co-founder of RYDA. This deal comes on the heels of a recent influx of prominent South Korean companies in Downtown L.A. Hanjin International Corp occupies a full floor at their Wilshire Grand Center property and grocery chain PK Market will open their first U.S. store and headquarters office at 712 S. Olive St. Both transactions were brokered by Cushman & Wakefield. In addition, Netmarble Corp, the largest video game company in South Korea, signed a 15k sf lease at 600 Wilshire Blvd last year.